Our system is built to stand up to the toughest environments and our systems are the preferred escalator announcement systems installed in the New York City subway system escalators. They utilize safety messages to remind passengers of safe riding practices in an effort to reduce accidents. The New York City subways present one of the toughest environments for a fully functioning automated messaging system. Click here to read more…. Airport Safety is always of the utmost importance. Sound View Electronics automated messaging systems help prevent accidents on airport moving walkways and airport escalators. 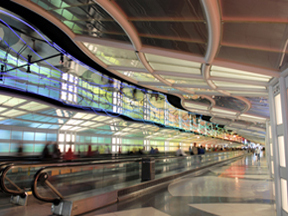 Additionally, our moving walkway announcement and escalator announcement systems can instruct and direct riders. Click here to read more…. Sound View Electronics automated messaging systems for escalators and moving walkways can help arenas keep their large crowds moving and aware of safety issues. Just imagine the home team won a real nail biter…the crowd is ecstatic! They are riding the escalators and celebrating. Little Jimmy has sat down on the escalator without anyone knowing. His Dad hears a message to hold children by the hand and sitting is not permitted on the escalator. Click here to read more…. Hotel safety is a paramount concern today. Just imagine that it is 2AM and a couple that has been out on the town gets on your hotel’s escalator. She is tired and exhaustedly leans on the escalator handrail. Her chiffon dress is dangerously close to being caught. Click here to read more…. Amusement park safety is vital to the experience of visitors. One little amusement park accident can ruin the entire day or more. Sound View Electronics automatic messaging system can help. Our systems are used by the NYC subway system and the World Trade Center in order to help prevent accidents. The best way to increase theme park safety is to avoid them entirely. Click here to read more…. Sound View Electronics automated messaging system offers malls and department store operators the most advanced systems for communicating with their escalator riders. 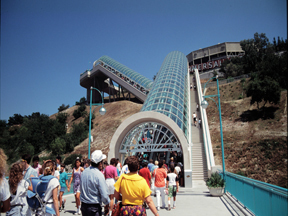 Many view our system as a retail store announcement and escalator safety system, which it is. Our systems also provide a great opportunity for advertising. Click here to read more…. Our automatic announcement systems can help you keep the flow of people moving by giving them directions or instructions while they are on your walkways or escalators. When your visitors leave the casino and are on the escalator you can give them directions to restaurant locations. Our systems are a unique and novel casino advertising vehicle. Click here to read more….